Perhaps the most astonishing natural phenomenon I've ever seen is that of flocking Snow Geese. 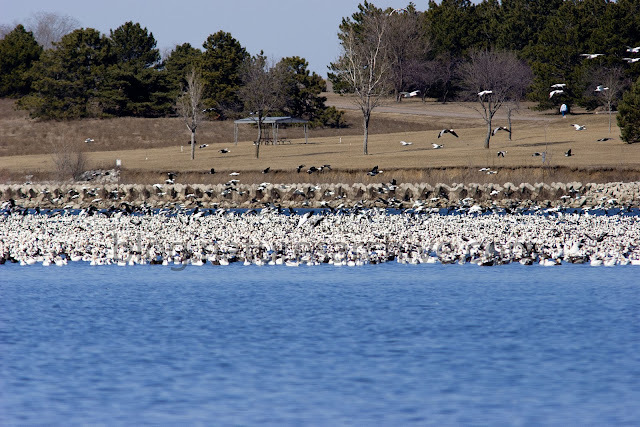 Along the Central Flyway, a North/South corridor stretching from Saskatchewan and Manitoba southward through Nebraska, and down to Texas, it is not uncommon for flocks of 50000 Snow Geese to gather on lakes and resovoirs. When I lived in Nebraska, one particularly warm late February day I decided to head to Branched Oak Lake, a State Recreation Area just west of Lincoln, NE. I had no idea what I'd find, but I was hoping for some early migrants and perhaps some hawks or eagles in the wooded areas around the lake. When I arrived and parked, I noticed what appeared to be a very large rocky dam in the middle of the lake. How odd, I thought. When I got out of my car I was immediately struck by a sound...something unfamiliar. After about 2 seconds I realized those rocks were thousands of geese, and that sound was the aggregate of them all vocalizing. As I watched in awe, I got my 300mm lens out and tried to capture the scene. After a couple of shots I noticed a Bald Eagle take flight from across the lake. That is all it took - the geese got spooked and took off. My eyes saw the birds take flight, and it took a couple of seconds before my ears heard the jet-like sound of the thousands of birds take flight all at once. In the photo above, note just how many geese remained on the lake even with the sky full of geese. 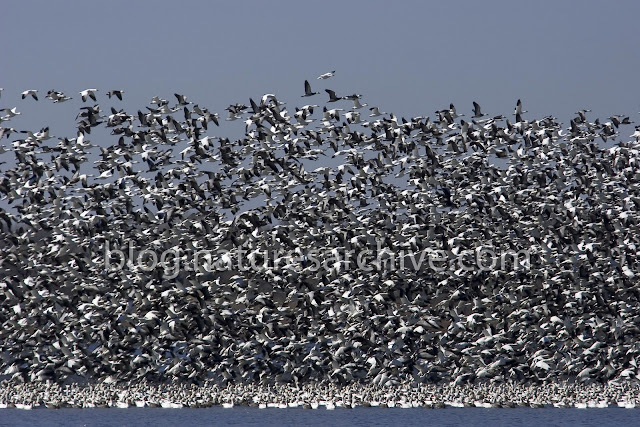 I can't even guess how many geese there were - 20,000? More? I can't wait until the day I get to witness such a spectacle again.